R4 Engineers - Manufacturer of structural steel fabrication, fabrication & beam plate girder fabrication since 2002 in Gurgaon, Haryana. There are various industries such construction, pharmaceutical, petroleum and other heavy engineering sectors, where various steel structures are required to carry out different applications. Our company has mastered the art of offering highly durable and reliable Steel Fabrication Structures to such industries. 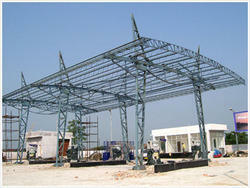 These structures are manufactured using quality raw material that are procured from renowned vendors of the industry. We also undertake the specific needs of the customer for fabricated steel items requiring specialized techniques, jig fixtures and proto modelling. Our integrated machinery permits us to replicate heavy engineering fabricated items at a very rapid pace so as to satisfy the growing needs of customers. Sometimes the fixture modelling procedures gives the customer a reasonable leveradge for design and fabrication of various models required for smaller or larger modules. We have also achieved expertise in the sphere of offering highly reliable and internationally acclaimed range of Customized Design, Fabrication & Erection of Steel Services to our customers. Before initiating the projects, we analyze clients' requirements and try our best to meet their requirements in the best possible manner. We have appointed a team of highly experienced team of professionals, who are adept at offering the aforesaid services to our customers within stipulated time frame. While carrying out Customized Design, Fabrication & Erection of Steel jobs, we remain in constant touch with the customer so as to ensure complete accuracy in the projects. 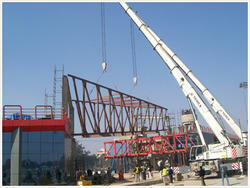 H Beam / Plate Box / Beam Plate Girder are demanded for various construction and material handling applications. To meet the requirements of construction industry, we have engaged ourselves in offering highly reliable fabrication services for H Beam / Plate Box / Beam Plate Girder Fabrication. These products are manufactured using graded raw material that ensure their robustness and corrosion resistance quality. The entire range of products are passed through strict quality tests that determines the excellence of the products. By virtue of our quality, adherence of stringent schedules and the machinery available with us including assembler and submerged arc machines from Lincoln USA we have been retained by Mrs Tata Blue Scope Steels Limited as their converting manufacturers of H Beams for northern India zone. Otherwise also we welcome the customers requiring plate girders upto 1500mm depth and 500mm width of flange. 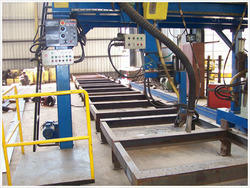 Even single piece weighing 19 tonnes (H Beam) can be fabricated and welded in our workshop. Apart from Petrol Pump Canopy, we also specialize in offering fabrication and erection services for Petrol Pump Signage And Hoardings. 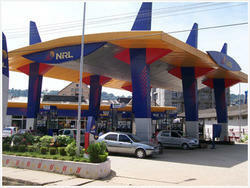 We are capable of providing any size of signages and hoarding that are required at Petrol Pumps. We maintain strict quality measures in our activities and try our best to offer highly impeccable range of services to our customers. 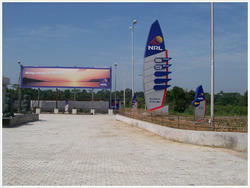 Our hoardings and signages can be customized as per the specifications, provided by our clients. 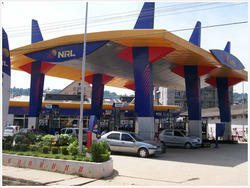 By virture of our quality and scheduled completions we continue to remain number one vender for petroleum retail outlets Ã¢â‚¬â€œ manufacturing for Numerli Gargh Refinery Limited for last 5 years we have made various petroleum retail outlets for NRL in the state of Haryana, U.P.,Chattisgarh, Assam, Meghalya and Nagaland. We also offer ACM (Aluminium Composite Material) Cladding that are used for various applications including Decoration of interior walls, ceilings, bathrooms, kitchens and balconies, Shop door decoration, Advertisement board display platforms & signboards and others. The products are of international quality and can be availed at competent rates. 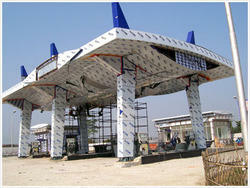 We undertake fabrication projects for qualitative range of Porta Cabins. These cabins can be easily assembled and dismantled on site. Further, the entire range of our porta cabins are appreciated for their flexibility and versatility. These can be erected at any construction site condition. These cabins are designed and developed as per the requirements of our clients. R4 Engineers specializes in the manufacturing of Porta Cabin/Porta Huts temporary & re-erectable structure with various specifications ranging from Sandwitched Thermode Panels , Polyester Colour,Coated GI/Galvalume Sheet wiyh Gypsum /Hilux Board Combinatio container type fabricated with panels of welded GI painted sheet welded to tubular steel frames. Porta that have simmilar proisions like any other permanent gallery e.g Doors, Windows,Lighting, Fixtures Foam ,air conditioners and switches for computers/LAN and other electrical accesories. The best part being the lesser time taken for erection of Porta Structure.All the Elements are boltable types and are manufactured with the total lase of relocation with minimum damage to the Porta Elements. We undertake fabrication projects for qualitative range of porta cabins and easy to shift offices. These cabins can be easily assembled and dismantled on site. Further, the entire range of our porta cabins are appreciated for their flexibility and versatility. These can be erected at any construction site condition. 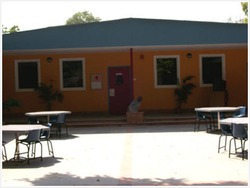 These cabins and offices are designed and developed as per the requirements of our clients. These mobile offices are container type and come with a maximum width of 3 mt and maximum length of 12 mt depending on customers requirements. Since this is the maximum size to be accommodated on a open body trailer. These mobile site offices are extremely useful for road construction and and companies and they cater as shelters for their employees also. Once the site shifts these offices can be loaded on the truck at a suitable location. We provide portable mobile site offices with all facilites like pantry, internal toilet, mobile toilet, security guard cabins etc. This cabins are most useful and durable. This cabins are most useful for those who required temporary accomodation on site, when their work is complete on that particular site then they can move this cabins to another site. We also undertake fabrication projects for qualitative range of Porta Cabin / Mobile Offices Interior. These Porta Cabin / Mobile Offices Interior can be easily assembled and dismantled on site. Further, the entire range of our porta cabins are appreciated for their flexibility and versatility. These can be erected at any construction site condition. 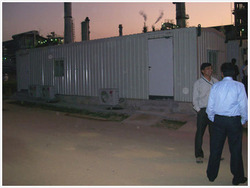 These cabins are designed and developed as per the requirements of our clients. Strong, durable and long lasting. We also assist our customers in erecting and installing Special Terrace Coverings / Roof Top Porta Structures that are needed in personal and business gatherings. We use high quality raw material for the fabrication and ensure that our coverings and roof top porta structures are durable and attractive. 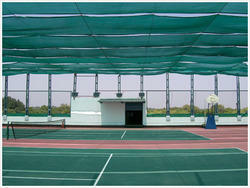 The above photograph shows covering of two number tennis courts measuring 32 mt Ã— 42 mt being the terrace of gymnasium of American Embassy School, made with special steel wire rope arrangement and fighting winches. Over Bridges are used for crossing road, rail track or any place on foot. Our company has achieved in carrying out fabrication jobs for a range off foot bridges that have been appreciated all over the world. These bridges are fabricated with supporting columns, stairs, roof and other material that ensure durability and reliability of the bridge as per requirement of our customers. 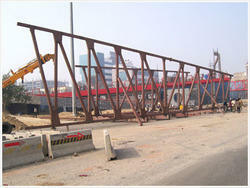 We are a top notch service provider for fabrication and erection of foot over bridges in India. The above photograph shows the foot over moderable bridge constructed for D.S constructions, for their Rajokari tolling location and erected as single piece with 40 tonnes weight. We have done foot over bridges connecting multi story blocks on 7th and 8th floor for rented building for Mrs Tata Consultancy in Udyog Vihar Gurgaon. We offer a wide range of fabrication services for Under Ground Storage Tank that are manufactured using quality metal products. The entire range of these Storage Tanks are widely used in various applications in Mining, Metallurgy, Steel, Oil & Gas, Chemical and Machinery medical treatment. 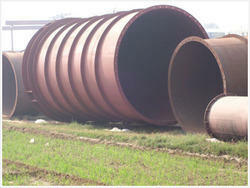 To meet the varied requirements of our clients, we can also offer the entire range of Under Ground Storage Tanks as per the specifications, provided by our clients. With the total infra infrastructure available including Lincoln's Sub ARC machines, cranes for material handling, rotators, skilled and qualified welders, we undertake the Steel fabrication based on sub arc welding jobs on job work basis and handing over the jobs to customers after Ultra sonic testing of welds. These jobs may include Pipe Welding, H Beam manufacture or the customised nature jobs. 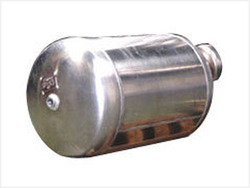 We manufacture a dynamic range of air tanks for heavy vehicles in different sizes and of high quality performance. 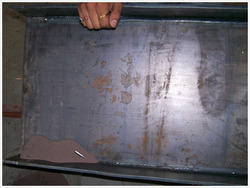 With proper care and expert handling we assure a lifetime activity of our product. Designed with latest technological know how these air tanks speak of greater consistency and accuracy because of large reservoir of air. 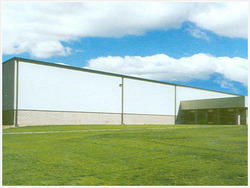 We also help our clients for fabrication of Pre Engineered Buildings, Warehouses And Sheds. These services are required for various industrial applications all around the world. 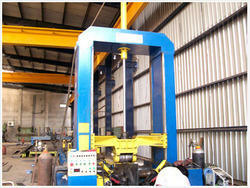 Our building, warehouse and sheds are fabricated as per the requirements of the customers. Our professionals discuss the entire methodology with clients and try to come up with effective solutions for Pre Engineered Buildings, Warehouses And Sheds Fabrication. In this present era of fast forward life styles with project execution time getting lesser day by day and labour for civil structural works becoming scarce and project management getting costly with time pre engineering buildeings have come into action providing solutions to the above bottlenecks. Here for R4engineers we provide complete solutions with designs, engineering, fabrication, erection and internal & external cladding of customer required building size.The total structure is fabricated in our workshop,their transported and erected at customer sets by our skilled workforce and machinery.So far having completed over 50 years such Building/Shed/Warehouse R4 Engineers planning to collaborate with a foreign collaborator to acchieve furthur recovery for thier consumers. 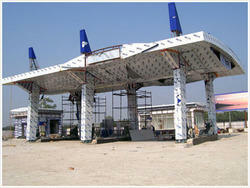 Our company has undertaken various jobs of fabricating Petrol Pump Canopy. Our robust infrastructure facility allows us to fabricate any size of canopy for our clients within stipulated time frame. 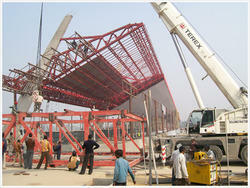 Apart from fabrication, we also help our customers in erecting the structures appropriately. 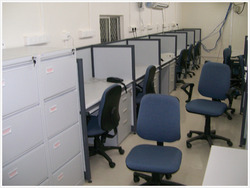 Our services are appreciated among our clients as these are offered at highly cost effective manner with utmost quality.